Click here to learn about how to buy Scythe games, accessories, and promos or here to learn about digital versions, art prints, and other merchandise. Printable FAQ: Andy Limkeman has put together a fantastic printable FAQ. This reflects the original intention of the rule, which allows a player to move a character/mech into a territory containing opponent worker(s), force those worker(s) to retreat, and then move a different unit through that territory. Completing Objective Cards: There was some ambiguity in the original rules about exactly when on your turn you could complete an objective. Usually the timing doesn’t matter, but for a few cards it does. So we clarified the timing as follows: “You may reveal a completed objective card during your own turn before or after you complete a top- or bottom-row action.” Basically, you can’t complete an objective in the middle of an action. Due to the speed at which an experienced player can finish a game of Scythe with the following faction mat/player mat combinations, they are banned (except when used by brand-new Scythe players during their first game). If you draw into either of these combinations during setup, return your player mat to the pool and gain another. Also, in 2-3 player games (where each player is likely to get more encounters), the Rusviet player cannot use their faction ability to place their player token on their Factory card on sequential turns. I have 8 worker meeples. 6 start on my player mat. Where do the other 2 go? Place those meeples on the 2 territories adjacent to your home base. Can I take an action more than once per turn? Nope. On your turn, you choose one section of your player mat, and you can either take the top action, the bottom action, both, or neither. You cannot take the same action more than once. When I use the Move action, can I move the same unit twice? No. You may only move 2 different units (or more, if you’ve upgraded the Move action). Can I move a unit 0 spaces? No. If you select a unit to move, and you don’t actually move it at least 1 space, it has not moved. When I use the Produce action, how much does it cost to produce workers? You produce workers in the same way that you produce resources, with Village as the terrain type that produces villagers. You first pay the cost to use the Produce action (the revealed cost in red at the top of the action). Then you gain the benefit (produce on 2 different territories–ALL workers on those 2 territories may product). For example, let’s say that you have 3 total workers on the board, which means that there is no exposed Produce cost in red. 2 of those workers are on a Mountain and the other worker is on a village. When you Produce, you pay nothing. Then you gain the benefit: Each of the workers on the mountain produces 1 metal, and the worker on the village produces 1 worker. The action is complete. The worker you produced revealed a cost, so the next time you take the Produce action, you must first pay that cost. If I’ve already deployed all 4 mechs, can I ever use the Deploy action again? Yes. All printed benefits on your player mat are optional, so you can pay to use a bottom-row action even if it is only to gain the associated coins and/or recruit ongoing benefit. It’s similar to the upgrade on the Produce action, with a bonus. If you upgrade the Produce action, you get to produce on 3 different territories, right? The Mill does the exact same thing–it’s a third territory for production (or a fourth if you’ve already upgraded the Produce action). In addition to that, if you choose the Mill’s territory as 1 of the 3 territories where you produce, the Mill itself produces as if it is a worker. If you choose to produce on the Mill’s territory (say, a mountain) and you have 1 worker there, the Mill produces 1 metal and the worker produces 1 metal. You could even choose the Mill’s territory if there are no workers there, and the Mill would still produce 1 metal (in that example) as if it were a worker. Here’s where Rodney talks about it in his Watch It Played video. Example: You have 1 worker each on a mountain, farm, and tundra. You also have a Mill on the village. When you select the Produce action, you may choose 2 territories from the mountain, farm, and tundra to produce on. The Mill is on the village, so the village will also produce if you want it to. The Mill itself will act as a worker for production, so it produces 1 worker. If you would had another worker on the village you may also produce 1 worker (though having a worker on the Mill’s territory is not necessary for it the Mill itself to produce). A BGG user created a short guide that explains the Mill here. Can I move a mech/character with Seaworthy or Submerge onto or off of a lake if they don’t have Riverwalk? Yes. There isn’t a river between your mech/character and the lake. Think of it like this: If you walk along the shore of a lake, is there a river between you and the lake? Nope. It’s just land, then water. 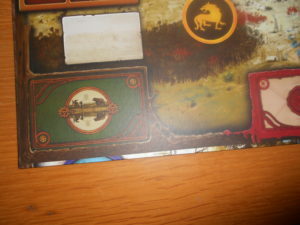 Same thing in Scythe–rivers are between two land territories, while a lake is adjacent to land territories. In 1-5 player games, does Crimea’s Wayfare ability allow it leave resources on home bases (theirs and inactive factions)? When using Wayfare, it’s possible for your character/mech to transport and drop off resources onto a home base. While those resources are on the home base, you cannot spend them and you will not count them during end-game scoring. When certain mech abilities have been unlocked, can Rusviet’s mechs and character move from their home base across the river onto the farm to the north? Can Polania do the same with the lake adjacent to their home base? Rusviet can use Riverwalk to cross from their home base to the farm to the north, and Polania can use Submerge to move from their home base to the lake to the north. If my mech/character ability lets me gain 2 power at the beginning of combat, and if that power boost would give me a star (16 total power), does the game end immediately or does that combat happen? Each individual combat happens in a self-contained bubble–once a combat begins, it continues through completion. This is a rare case where it’s possible for two players to have 6 stars (it is not possible to get a 7th star, as there is no 7th star token). Yes (consistent with other rules about Trap and Flag placement, of course). If Albion has a Flag on the Factory at the end of the game (and they control that territory), the Factory is worth a total of 4 territories for end-game scoring. How exactly does the timing of placing a Flag work with the Rally ability (or Traps with Shinobi)? If your character lands on a territory that results in no combat and no encounter, they may immediately place a trap/flag token. If you have movement available (and shinobi/rally unlocked), you may then move a mech to that territory. If your character is on a combat/encounter territory, you must wait until all units’ movements end. Then you perform the combat and/or encounter, and afterwards–if you still control the territory–you may place a trap/flag. The dials are available as promos. Yes! Almost all of our international partners for Scythe also have the expansion. Toll: It’s possible for 2 players to park their airships right outside of an opponent’s home base, preventing that opponent’s units from leaving. This isn’t in the spirit of the game, so as an errata, we’re saying that airships with Toll cannot be placed on either of an opponent’s starting territories (basically, you can’t block them in). With Toll, if there are 2 airships on a territory and a third player wants to enter the territory with their ground unit, what happens? The ground unit must be able to pay the toll to both of the airships to enter the territory. The ground unit chooses which player to pay first. That player (the airship’s controller) chooses a resource from the ground unit, then the other player chooses. Can I move an airship 0 spaces to pick up or drop off workers/resources? No. If you select a unit to move, and you don’t actually move it at least 1 space, it has not moved, so you may not pick up or drop off workers/resources. Why are all the airship miniatures the same sculpt? Each of the 7 factions has 1 airship miniature in their faction color, but the sculpts are identical. There are three reasons for this: One, thematically, all airships have the same abilities (the abilities are randomized at the beginning of each game). We tested it both ways, and it worked best this way. Two, the cost to make a high-quality mould for a miniature this size is about $10,000. Expansions like this are a low-margin product, so adding an additional $60,000 for six more moulds is a significant expense. Three–and this is really important–when we get the original sculpt from a 3D modeler, it’s not like we instantly start making miniatures. Rather, it’s the beginning of an extensive process to maximize the durability and aesthetics, as well as exactly how different parts of the mini will fit into the mould (big miniatures like this are often comprised of multiple pieces). For the Wind Gambit, this process took 2 months for a single miniature. At the end of that process, I actually sent the updated digital model to the original sculptor so he could do some final touch-ups to the updated design. This was particularly important because Panda was in charge of ensuring that workers and resource tokens could fit onto the miniature. Don’t the airships make the Nordic faction ability worthless? The Nordic ability is quite different from the airship ability. With Nordic’s ability, your workers can cross rivers at any time, allowing them to go in completely different directions, establish area control, and build/deploy/produce. With airships, you can only pick up or drop off workers during the airship’s movement, and the airship can’t divide a conquer the way multiple workers can, nor can workers on airships do anything (they don’t control territories, build, deploy, produce, etc). Also, only half of the airships can carry workers. Am I missing Automa card #7? Nope! There is no Automa card #7. Is the French version okay? There are some typos in the first printing of the French version of The Wind Gambit, but it is still playable. For more information, please scroll down this page to read the message from Matagot. Unboxing: Even though you shouldn’t look in the various tuckboxes before the game tells you to, if you do, you might find that there are only 3 mechs in the Fenris box (Box D). Before you fill out the replacement parts form, please look inside Box C to find the 4th mech. Alliances (Episode 2): If you’re playing with 6-7 players (Invaders from Afar), Polania has an upgraded faction ability. However, their Alliance token retains their original faction ability for the player they ally with. The fewest coins you can end the game with–even after breaking an Alliance that may drop you below $0–is $0. Township (Episode 3): In this episode, the rulebook notes that the Rusviet faction is required to replace the normal “Township” mech ability with an alternate ability. However, if mech mods have been unlocked, the Rusviet player could replace Township with a mech mod instead. Vesna (End of Episode 3): The new Vesna player actually should not use their previous home base, as that faction may be claimed by another player. Rather, after faction selection, the Vesna player chooses a home base from among the unselected factions (placing their home base tile there on subsequent games). Vesna’s airship does not include a plastic stand, as you need The Wind Gambit to play with the airship, and more than enough plastic stands are included in The Wind Gambit. Automa (choosing a home base): If at any time the Automa needs to choose a home base, mix the icon tokens for all unselected home bases and draw one for the Automa. Fenris Agents (Episode 4 – French version): There is a small mistranslation in the French version. Please put 2 Fenris agents on the Factory at the beginning of the game, not 1. Fenris Agents (Episode 4 Automa): For the move worker action, territories with Fenris agents cannot be valid. For ALL other Automa movement actions, Fenris agents are ignored when identifying valid territories. Infrastructure Mods: For the Spy mod, remove the words “or Faction”–that’s a remnant from an older version. The Spy mod only impacts mech abilities (which grant special abilities to mechs and characters). Infrastructure mods such as Spy, Propaganda, and Cavalry may only be used in combat/movement that the mod owner is participating in. All other infrastructure mods may only be used during your turn. First unlock (Episode 5): Play game 5 until a player has the opportunity to move a unit to the Factory for the first time, then read the next line here. Continue movement of all units as usual, but any units that reach the Factory while Box C is still in play must stop. When dealing with the thing you unlock, draw 4 cards, not 3 (the original rulebook says 3). End of Episode 5: You’ve now unlocked 2 airships (1 for Vesna, 1 for Fenris), but no airship stands. This is on purpose–no stands are included in The Rise of Fenris. You can only use the airships when playing with The Wind Gambit expansion, and you can only use a total of 7 airships at a time (in a 7-player game), so you already have enough stands (7) in The Wind Gambit to cover that necessity. Polish version (End of Episode 5): While the Vesna player may not change factions at this point, they may change later when the game tells them. Fenris (End of Episode 5): The fewest coins you can end the game with–even after gaining Influence tokens that may reduce your coin total below $0–is $0. Also, when using the faction ability, you can only place the faraway influence token if your character also placed an influence token on its territory this turn. Episode 8B: If you enter 2 combats on your turn, and if one of them is against Mad Tesla on the Factory, you must execute that combat first. Episode 8B (Automa): The Automa gains popularity in the exact same way that you do when (and only when) fighting Mad Tesla. End of Episode 8: If you don’t want to write in your book, you can download and print the campaign scoring guide here. What are some things I should keep in mind during my first play of Scythe (single player)? Do I need multiple sets of the expansion Automa cards if I also have multiple sets of the original Automa deck? Basically, if you purchased Scythe after the Kickstarter campaign, you have the correct versions of cards 5, 8, 18, and 19. You don’t need any other versions of those cards, and if you got them in your copy of Invaders from Afar, you can recycle them, as they’re redundant. The current version of the deck will work with any faction (original or expansion). The original deck wouldn’t work with the two new factions. The 4 replacement cards (the expansion set) are identical to the cards they replace in the original deck, with the following exception: These 4 new cards have faction specific actions for the two new factions. Therefore, you ONLY need to have these cards in your deck, if that deck was published before the expansion and if you are having the Automa play one of the two new factions (the new cards still work fine if you are not playing one of the two new factions). If you are updating original Automa decks, you need a maximum of two expansion sets and this is only if you are having the Automa play as BOTH of the new factions at the same time. As an example, you could play as Albion against the Automa who is playing, Togawa, Rusviet, and Polonia, with three Automa decks, but only one needs to have been updated with the expansion set (for Togawa). When the Automa gains its first star from the Star Tracker, when do I reshuffle its deck? Reshuffle before the Automa’s next turn. If the character and the mech are at the home base, what is the automa priority order for combat? How does an attacking move work when no Automa combat units are on any territory but there’s a mech and the character on the Automa’s base? In this case, the Automa moves the character. What are some things I should keep in mind during my first play of Scythe (multiplayer)? Complete the steps of each action from top to bottom. This is particularly important on the Produce action. Before you do anything else on that action, pay the cost (if any). Are you done paying the cost? Good. Now proceed to gain the benefit. Overlapping turns. There is a note in the rulebook that says that when the opponent to your right is taking a bottom-row action, you can start to take your turn. That’s because an opponent’s bottom-row action rarely has an immediate impact on you. Once you get into the flow of doing this, you can significantly decrease Scythe’s playing time. Scoring over $100 is very rare, except in low-player-count games with little combat. If you score over $100, there’s a good chance you might be missing an important rule. I would recommend you read Highlighted Rules on page 31 (in fact, I would recommend that to everyone after your first game). Since the first player is the player with person with the lowest-numbered player mat, it’s possible for the next player (clockwise) to have a much higher-numbered player mat with more starting components than the next player. How is that fair? The starting resources on the player mats are staggered based on two factors (both of which have a very minor impact on the game): One, player order. Two, the playtest data for each individual mat (which shifted around in terms of numerical order during playtesting). So even if the #5 mat is in the second position in clockwise order, part of the balance of that mat’s starting resources is that the #5 player mat appeared to be ever so slightly weaker than the others during the blind playtest process. Overall, though, the impact on the game is very, very small. If you find it’s more fun for you to deal out the mats clockwise by number, it will not break the game. Team Variant: Play Scythe in teams of 2 (decide teams at the beginning of the game). Play everything as normal, except each team has 10 stars to place (instead of 6 per player), and they may only place 1 star on each section of the Triumph Track (the Saxony player does not have this limitation for objectives and combat). At the end of the game, count up each player’s coins, add them to their partner’s coins, and compare each team’s total to determine the winner. End-Game Variant: When a player places their 6th star, their turn immediately ends, and each other player may take one final turn. However, those players may not take Move actions. Here is some of the official music from Scythe Digital, playable via Soundcloud during any game of Scythe. Why is there a place on the board for objective cards? Is there a painting guide I can use to beautify my Scythe miniatures? Tabletop Gaming magazine has a great painting guide in their October issue. Why does a little bit of the back-of-board art show up on the edges of the front of the board? When you print a double–sided board, you’re actually printing two pieces of paper and applying one to side A and one to side B. You have to apply one piece of paper first, then the other. The second piece of paper has to wrap around the other side a little bit to stay in place. Usually you don’t notice this in a game because the board only has one side or the two sides are very similar. But in the case of Scythe, the art of the back is at a different scale than the front. We decided to wrap it the way we did so players who use the extended board would have a seamless game board—the seam between the board and the board extension would be disrupted by the extra wrapping. Can I log my game stats somewhere and see if some factions or player mats are stronger than others? Why do the character miniatures in the current retail version look slightly different than the original versions? After making 40,000 or so miniatures, we had to update the moulds for the original Scythe characters. Whenever we do that, we take the opportunity to improve details and durability. They’re the same miniature sculpts, just with slightly different moulds. A few people have asked if they could purchase the updated models, so we’ve made them available here (the 2 Invaders from Afar characters are included, though they have not changed). Why is Scythe classified as a 4x game? Explore: In Scythe, characters are moving from their homeland onto a patch of land surrounding the mysterious Factory. The landscape itself is known–you can look across the horizon and see there’s a mountain there. What you don’t know is (a) the encounters you’ll have along the way and (b) what you’ll find when you get to the Factory. It’s in those elements of discovery that you are exploring in Scythe. Exterminate: In Scythe, players can use mechs and characters attack other players and eliminate opposing units from territories. It’s true that you’re not permanently killing units, though in any game it’s tough to kill an inanimate plastic token (maybe melt it?). It’s also true that Scythe is more often about the threat of combat than combat itself. All of that said, I don’t want people thinking that Scythe is a game about flipping over hexes and constantly killing opponents’ troops. Rather, I hope people see Scythe as a different take on 4x. Why is a dollar sign used for currency instead of another symbol? Jakub and I discussed in detail which symbol we should use for currency in Scythe, and we decided that the $ sign was the clearest symbol. Each coin in Scythe’s fictional 1920s universe is based on a different faction–there is no universal currency (the Euro didn’t exist yet). Yes, we could have created a new symbol, but it would have been yet another symbol for players to remember. We had the choice between making something up (which would have confused a lot of people) or using a universally recognized symbol for money. We chose the latter, especially since $ is used to represent currency for a number of real-world countries. This decision was well informed by discussions with backers and finalized during the Kickstarter campaign. Why are there typos in the art book? There are about 8 pages with text in the entire book. 7 of them were proofread and are near-perfect. 1 of them (page 4) was not, and it’s for a reason. Page 4 contains a letter written by Jakub to the reader of the book. Jakub’s English is excellent, but it’s not his first language. I could have edited and rewritten Jakub’s letter, but it would be like editing an exact quote. You can’t do that (well, you can, but I didn’t feel it was right). Please don’t read page 4 and see typos. Read page 4 and see the words of an artist who put his heart into the world of Scythe–the art, the game, and the book. Jakub is very proud of this book, so give him the opportunity to speak to you on page 4 as if you were looking him eye to eye, thanking him for letting us into his world. Why isn’t the board modular? There are five key reasons why the original board wasn’t modular. The rivers are biggest challenge in creating a modular board. If the board were a random set of hexagonal tiles, you would have rivers that only run along a single edge between tiles, which doesn’t really serve a mechanical purpose (nor does it work aesthetically or thematically). The art simply wouldn’t be nearly as cohesive if it were made of modular tiles. The Scythe board tells a story; modular hexes do not. The world of Scythe isn’t modular–this is a specific world we’ve built that’s based on an alternate-history 1920s Eastern Europe, not a random one generated by the players. The map is one of the biggest aspects of the faction-based asymmetry in the game. We’ve designed the Nordic faction’s abilities based on them starting in the north with limited access to certain resources, for example, and all factions have a mech “riverwalk” ability that correlates precisely to their homeland. Same with all the other factions. The board includes three tracks and several places to put cards, which allows for better organization than if these items were floating around the table. There’s already a lot of variability in the Scythe setup (namely, 25 different combinations of faction and player mats and tons of different objective and encounter cards). Will you ever sell a special version of Scythe that includes everything? While we appreciate the interest that some people might have in an all-in-one version of Scythe (the game, all expansions, all accessories, and all promos), there are a few reasons why we won’t be doing that. First, it would be prohibitively expensive for customers (around $300), which also makes it very difficult to sell via distribution channels. Second, it would be a 180 reversal for us, as we’ve said for years that we wouldn’t make such a product, and many people have bought into Scythe’s ala-carte style system–it wouldn’t be fair to them. Third, the ala carte system allows people to pick and choose exactly which elements of Scythe they want, which ensures that everyone pays for exactly what they want, nothing more. For those reasons, we won’t be making an all-in-one version of Scythe. Will you ever make a Scythe RPG (role-playing game)? We considered it a while ago, and we even accepted a few submissions for a Scythe RPG. But then I realized that I know nothing about RPGs—I couldn’t judge the quality of the submissions, and even if we did publish it, the RPG market is completely different than the hobby game market (I know how the hobby game market works, but not the RPG market). So while Stonemaier Games won’t be publishing a Scythe RPG, it is possible that Jakub will publish one in the future, as he owns the rights to his 1920+ world. Is Iron Harvest a Scythe video game? –Iron Harvest is a video game set in the same 1920+ world (created by Jakub Rozalski) as Scythe. It is a real-time combat game developed by a company called King Art Games. –Stonemaier Games has absolutely no connection to Iron Harvest (other than the personal connection that we support Jakub). –Jakub owns the entire 1920+ intellectual property (Stonemaier Games only has the tabletop game rights). That’s why there’s content out there–like Iron Harvest, puzzles, framed art, etc–that inhabits the same world but has no connection to Stonemaier Games. –Scythe Digital is different than Iron Harvest. Whereas Iron Harvest is a real-time combat game, Scythe Digital is the Scythe board game in digital form with full AI. Should I consider dual-layered mats in my game, just like Scythe? Also, from the graphic design perspective, it’s kind of a nightmare, as the graphic designer needs to create 3 different layers for each mat. I’ve attached an example here from the Scythe expansion. How big and heavy is Scythe? All versions of Scythe are 300 x 365 x 98mm. The weight of the retail version is 3.28 kg (7.2 lbs). What are the card totals for the KS editions of Scythe? In the KS versions, the promos are in the same shrinkwrap as the other cards.